I think we've hit a sweet spot in our schooling. We have a groove and system that is working. For now. I'm not naive enough to believe that our current system is going to work for anything longer than the next month few weeks or so, but at least the groove we have is working during our busy fall season. Soon, we hit a spate of time where we hunker down into the depths of autumn, Thanksgiving, and Christmas. Then everything gets crazy-fun again with ski season. I've never been one who schedules out our day minute-by-minute. Well, admittedly, I did try a detailed schedule. It lasted about 30 minutes. That kind of structure is too rigid for me. 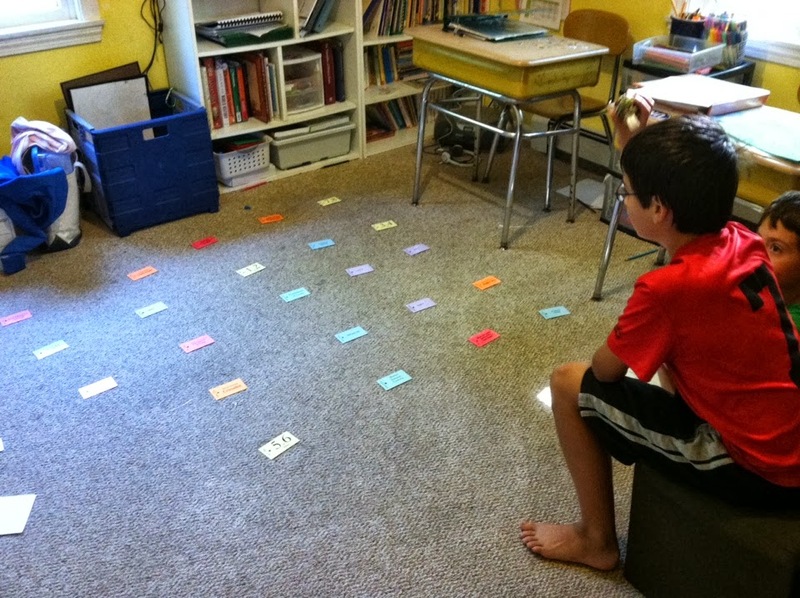 Plus, life happens -- car batteries die, read-alouds are too interesting, math facts don't get memorized as planned. Truly, this looks very neat and tidy, but in all honesty, it is still quite flexible and messy, but it is a guide for us, and is working quite well. Each boy has a laminated sheet that lists out all their independent work (math, handwriting, independent reading, instrument practice, chores, typing). When it is their Independent time, they use their sheet and a dry erase marker to check off their progress. It still amazes me how easy it is to get my boys to accomplish things when a dry erase marker is involved. Of course, you'll see Ben noticeably absent from this general weekly schedule. I usually make contact with him in and around this schedule, but I will admit that as a CC Challenge Mom, I'm not engaging as much as I'd like to. 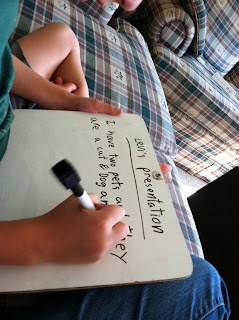 Since I have a rhythm/ routine with The Littles, I'm going to be intentional on connecting more with Ben to quiz him on Latin vocabulary and grammar (I'm learning it, too), work on helping him plan out writing assignments (I've done well in this area this week!) and discussing his current events. Last week he had to take the side of pro-gun control. That was a stretch for him. As far as school work, We have learned about the water cycle, the carbon/ oxygen cycle (photosynthesis), and the nitrogen cycle (much more complicated to explain, but this video about the nitrogen cycle in a fish tank helped us understand it at a micro-ecosystem level). Levi excitedly planned his presentation for next week. He is going to talk about his two favorite family members -- Daisy, our dog, and Tiger, our cat. 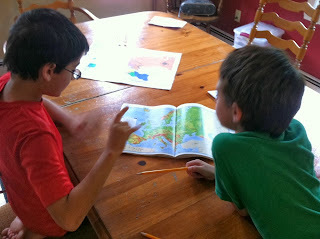 I love all the geography the boys are learning. Every few weeks, we are pulling out the atlas and discussing these features in detail. This week we traced the source of the major European rivers that the boys have learned, discussing the countries they pass through (and borders they help define), and their mouths. For review of four weeks of memory week, we spread our all the cards, and the boys threw a small bean bag at a card. I LOVED the boys art project this week. 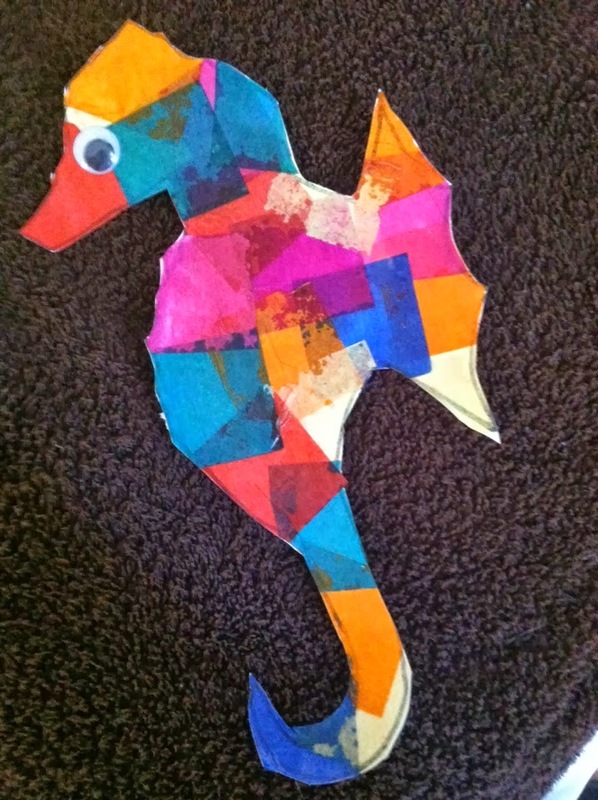 They used tissue paper (a la Eric Carle) to embellish a seahorse. Luke didn't bring his home, but we modge-podged Levi's and it turned out SO cool. This week's history (we focus on this on Monday) was the Crusades. We used some of our history resources to read about this time and Luke narrated a passage to me then copied it into his history notebook.